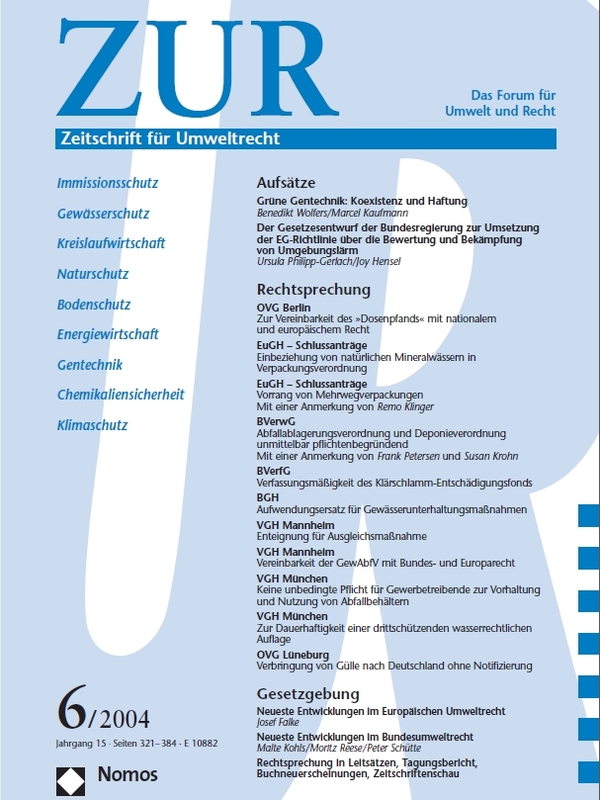 In the ZUR - Zeitschrift für Umweltrecht, Peter Beyer analyses the new European Directive on environmental liability. The liability for damages caused to the environment by emissions as well as accidents in the field of industrial productions and transportation of dangerous goods belongs to the issues which have been controversially discussed in politics for years, regularly brought up by spectacular accidents as in Baia Mare or the sinking of the Prestige off the Spanish coast. It has been by now acknowledged that the costs of such accidents can be internalised through the instrument of absolute liability. Norms for liability regardless of negligence aim to incite businesses to invest in damage prevention until the point where the investment does not pay off compared to the expected potential liability. Thus, the absolute liability warrants first that, following the polluter-pays-principle, not the community but the polluter bears the costs of a damage. Further, it can also, as an instrument of precaution, decrease the risk of damages overall. When it comes to the implementation however, one specific damage category regularly poses difficulties: the so-called ecological damage. The term "ecological damage" implies a negative alteration of the air, water, soil, flora and fauna and its interdependencies. It differs from the broad term of "environmental damage" in as far as it is not conditional on economic loss: The adverse effect on the environment is sufficient. Liability systems under private law do not cover these damages, as generally both damage and plaintiff are missing when the negative alteration takes place on natural assets with no economic value, such as seabirds or forests with no economic usage. In order to fill in this gap on the European level, the European Commission, after it published a Green Paper, a White Paper and a working paper of the Directorate-General for Environment, finally made a proposal to the Council about a Directive for Environmental Liability for the prevention of environmental damages and the decontamination of the environment . The concept of the proposal basically follows the Commission's Whitebook and was largely inspired by the American "Comprehensive Environmental Response, Compensation and Liability Act - CERCLA" from 1980. According to the European Parliament and the Economic and Social committee, the Council of Ministers adopted a common position in September 2003 which takes into consideration more than half of the proposed amendments given by Parliament. The second reading resulted in the European Parliament demanding four changes in the common position, relative among others to compulsory coverage and the relation between shipowners and international liability law. The Council of Ministers declined the proposals. In the following conciliation procedure the Parliament and the Council of Ministers eventually agreed on a final text in February 2004. Journal Article: Eine neue Dimension der Umwelthaftung in Europa? Beyer, Peter 2004: "Eine neue Dimension der Umwelthaftung in Europa? Eine Analyse der Europäischen Richtlinie zur Umwelthaftung". Zeitschrift für Umweltrecht, Vol. 16, No. 5, 257-265.